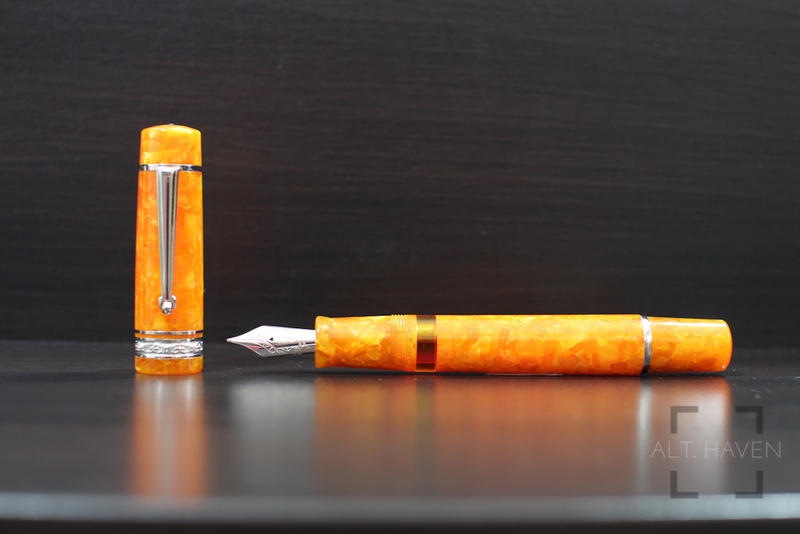 Delta fountain pens have been all the craze over here on the Singapore Fountain Pen Lovers’ Facebook group. I suspect the members of the group have single handedly wiped out the entire stock available on eBay. 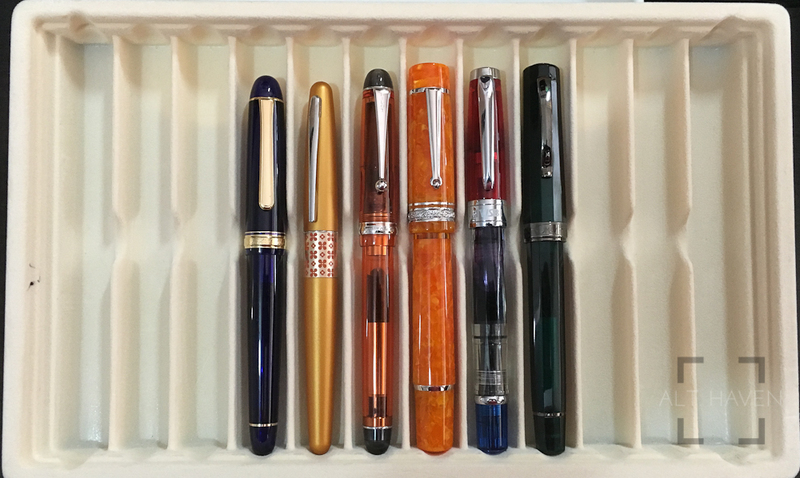 I picked mine up a few months before the craze and got a good price on the all orange, very flashy Delta Dolcevita Stantuffo Oro. 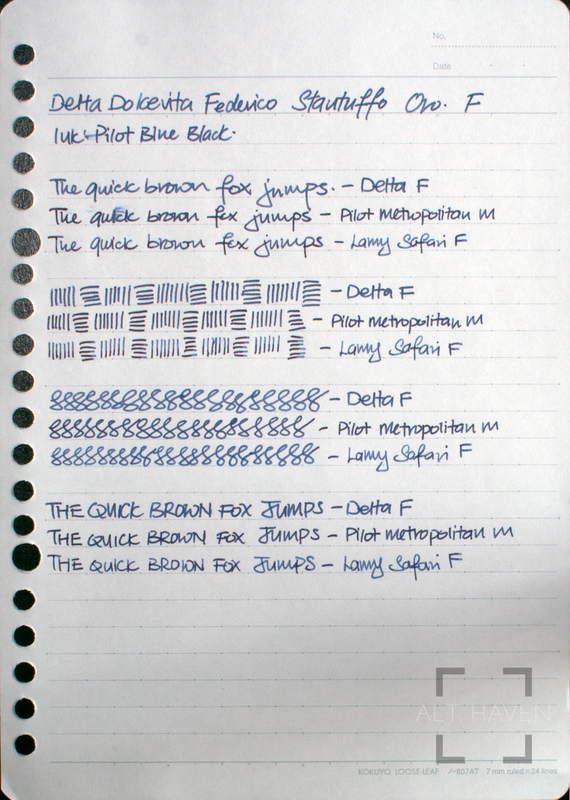 Delta has a range of different fountain pens in the Dolcevita line up and the naming can be confusing. The Medium is a cartridge converter pen. The Oversize is well… large and a piston filler. 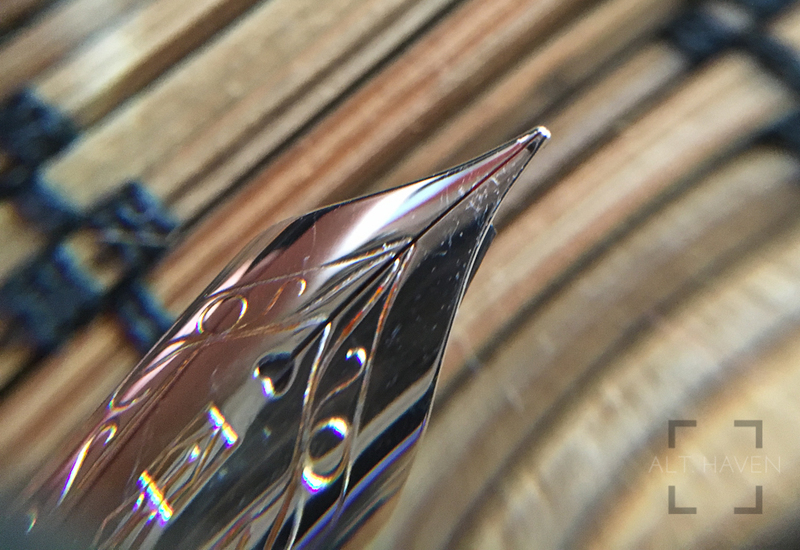 The one I am reviewing today is the Stantuffo, it is a piston filler model and it comes either with the Delta Fusion nib or 14K gold nib. Delta has outdone themselves in terms of the packaging. The box is huge and heavy. 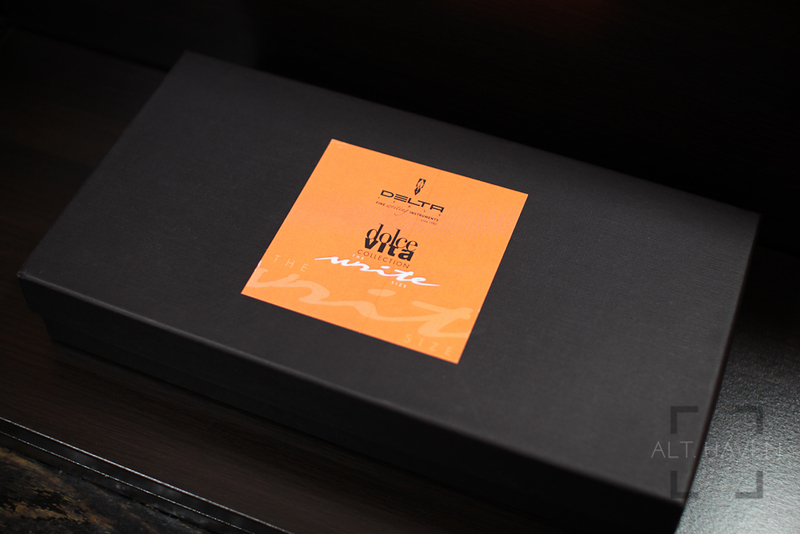 It has an outer black cardboard box with the orange Delta sticker. Remove the cover and you will find a plastic box secured with screws. 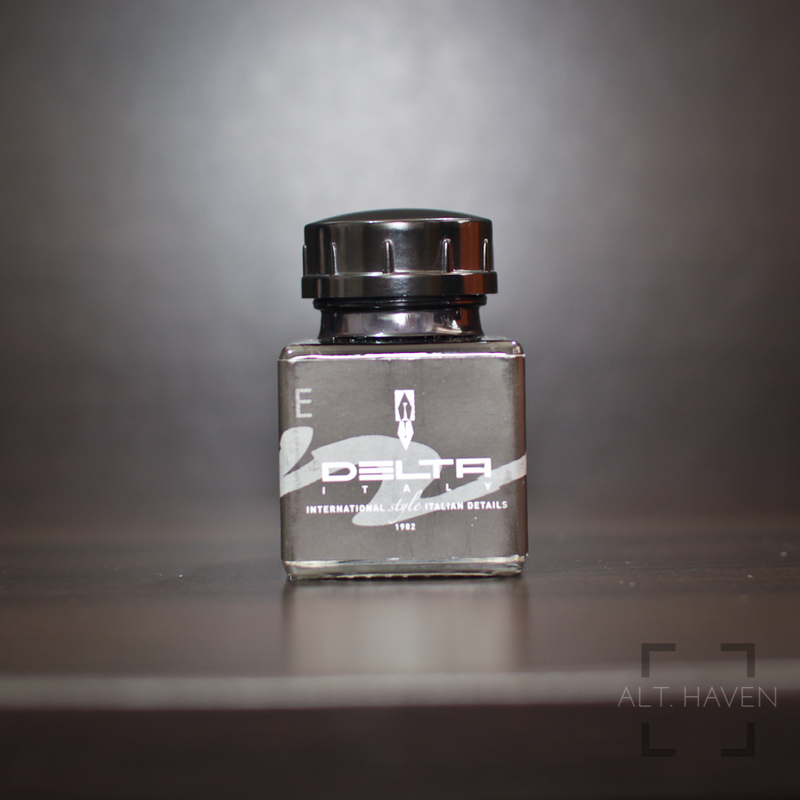 Next to the plastic box is a small bottle of Delta black ink. Under that plastic box is all the usual papers and instructions. Unscrewing the plastic cover, you will find the pen nestled in a bow tie shaped cut out. The entire packaging is as ostentatious as the pen itself. 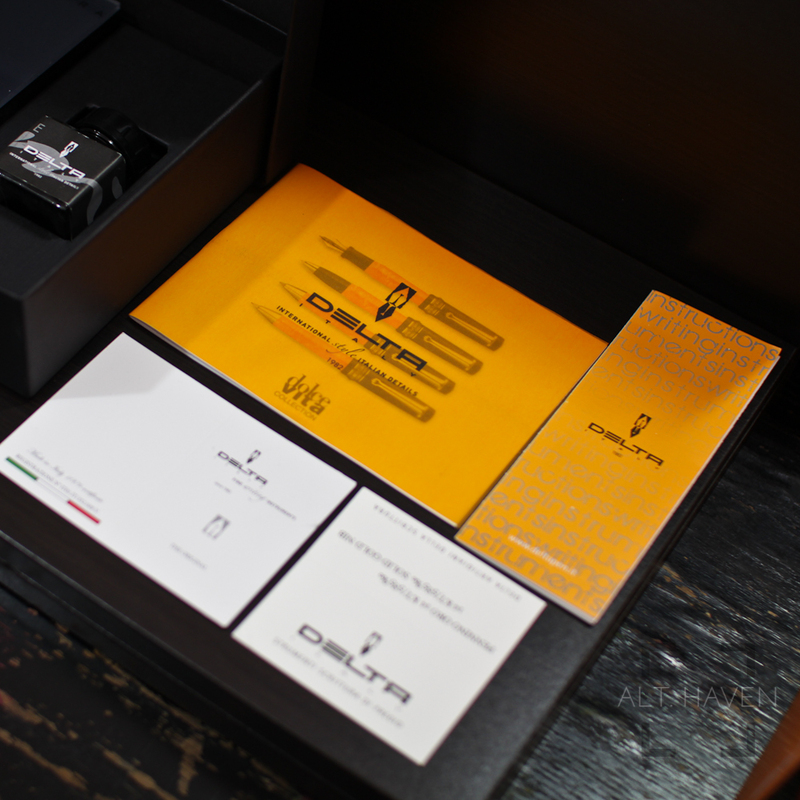 Maybe it’s more than a little pretentious but I must say Delta knows how to impress with its packaging. Personally, I’d rather they had the pen in a smaller, more compact packaging, to save me on shipping if nothing else. 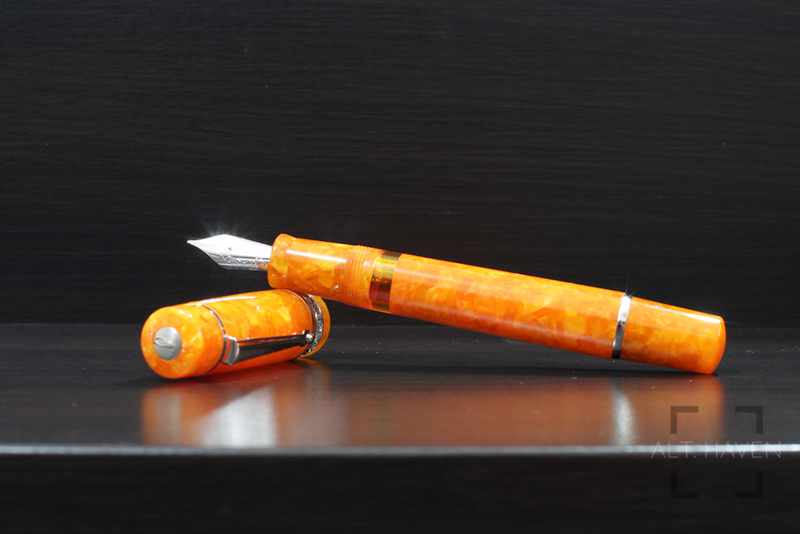 The Delta Dolcevita Stantuffo is bright and flashy in all its marbled orange glory. It is a good size fountain pen but not too big that it’s too heavy. 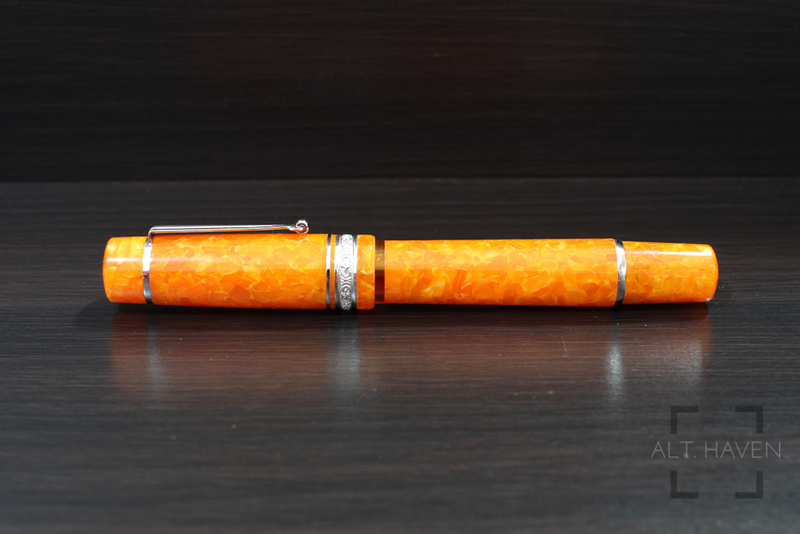 The pen is made of an acrylic material that looks like orange crushed ice. The material does help cover most of the pen mechanism but some are still visible underneath it all. The pen is mostly a straight, equal diameter barrel but it flares out slightly towards the piston knob. There is a slight step at the piston knob and it ends with a diameter slightly narrower than the barrel. The cap is just slightly larger than the barrel. The end cap unscrews easily to reveal the piston knob. 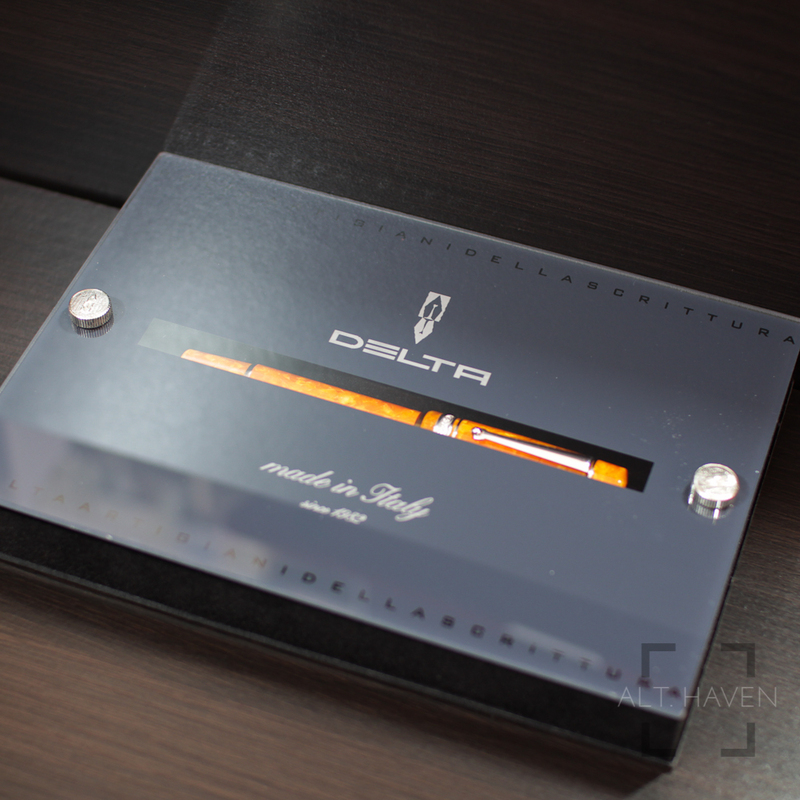 The Delta Dolcevita Stantuffo do feel back heavy because of the metal piston knob and the metal furniture at the end of the pen. The balance does get worse the higher your writing angle is. You can post the cap if you are inclined to but the balance totally goes out of the window when you do that. 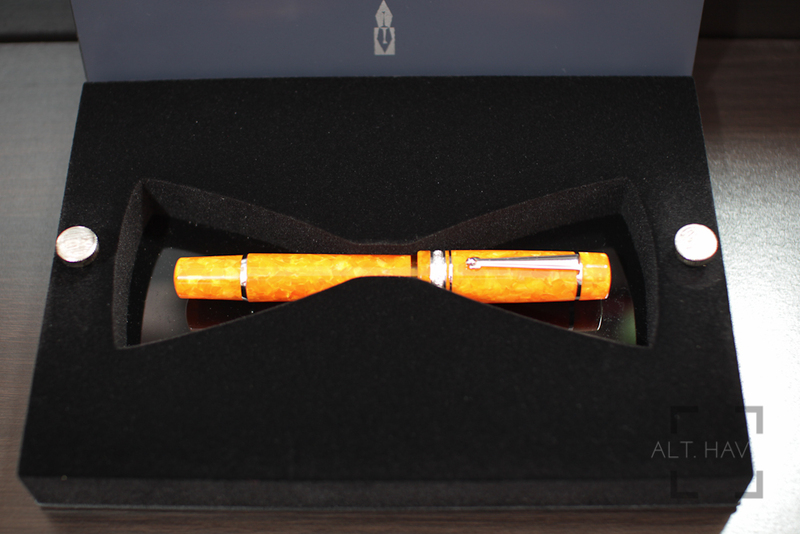 The pen is accented by rhodium trim except for the centre band which is made of sterling silver 925. There are models of the same name but doesn’t have the sterling silver centre band. One way to differentiate between the two is the detail on the centre band. The one with the sterling silver has the design engraved on the centre band while the other is laser etched. The Delta Dolcevita Stantuffo has the traditional clip with roller. It is secured to the cap via a band on the exterior of the cap. The roller helps with securing the pen over a pocket or a pen case. There is a faint imprint of the words “Delta, Dolcevita, Midsize” at the cap. There is also the number 35460 / Italy just above the centre band. The cap unscrews in less than a single revolution. The grip of the pen is nice and wide. It is neither so wide I have trouble wrapping my fingers around it nor so narrow that I cannot hang onto the fountain pen. 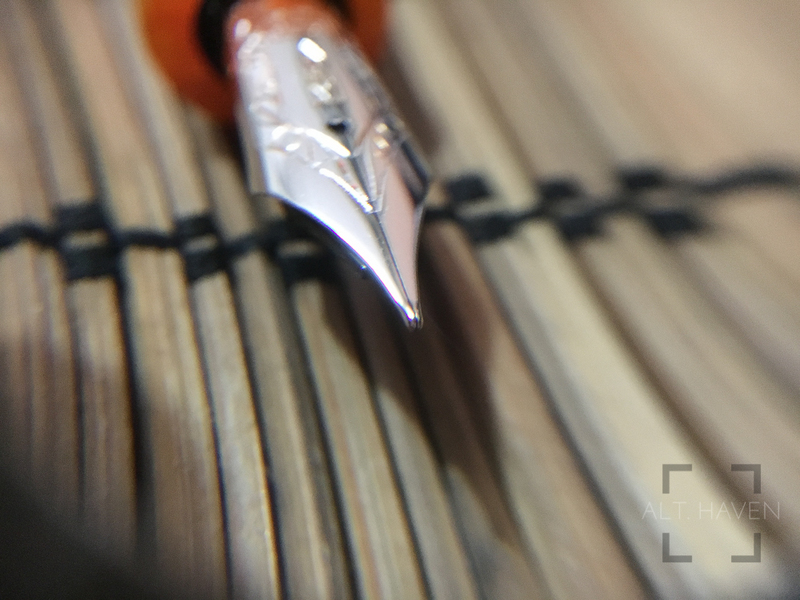 This is a grip I enjoy, it is ever so slightly convex and ends with a slight lip before the nib to guide your fingers to a natural stopping point. The threads are not sharp and are gentle on the fingers. The tinted ink window is nice and easily visible even when capped. 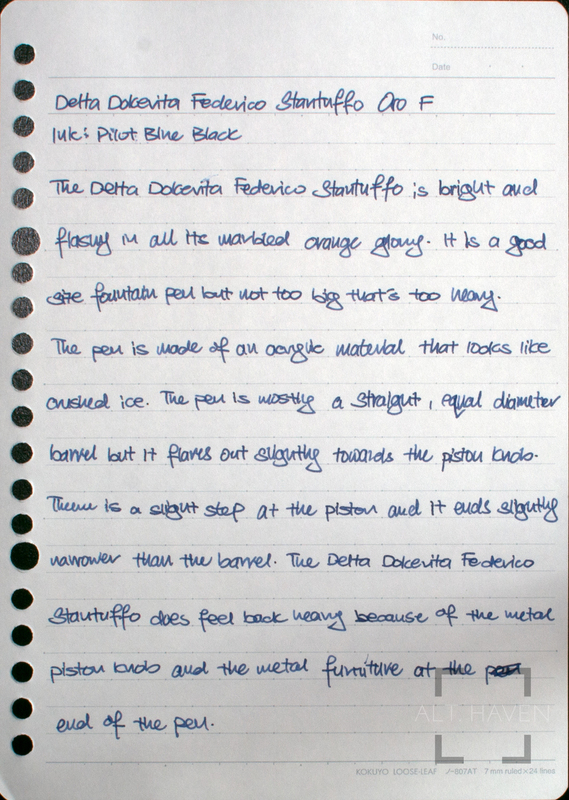 The Delta Dolcevita Stantuffo is a piston filler pen. The piston moves up and down the barrel easily. The knob turns smoothly and without trouble. However as you turn the knob you might notice it clicks. There is a clutch allows you to continue turning the knob even if the piston is fully retracted. The piston filler system provides a good amount ink capacity over a standard cartridge converter system. I opted for the 14k F nib for this pen. I am not sure if it is my writing angle or just my luck, the nib and feed is a little misaligned like my Delta The Journal fountain pen. It doesn’t affect the writing experience as far as I can tell. The nib writes like a true fine nib and it is rather stiff. Personally I prefer my nibs to be on the stiffer side. It aids in quick writing and works better with my writing style. If you are looking for a juicy, flexy nib you are barking up the wrong tree. Personally, I find the nib lacking in character but there is a stub nib option is available with an additional fee. In terms of balance between the size of the nib and the body of the pen, the nib does looked a little on the small side but I got the pen at a good price so I can’t complain. A flagship Delta fountain pen with a 14K gold nib at an excellent price what’s there to complain about? The piston knob clutch is an interesting feature that I wished that all piston filler pens come standard with. Though the balance is slightly off for me, this is a well made pen with a nib that writes well for my style. If you can find one for a good price, get it. I wouldn’t recommend paying full retail price for it though.